Belgian investors represented over 58 per cent of total buyers in 20174 alongside various foreign investors (such as Asian pensions funds and German institutional investors). Although the Brussels Capital region remains the preferred location of Belgian and foreign investors in view of its inherent value and attractive yields,5 regional office markets (especially in Antwerp, Ghent and Liège) are emerging as an alternative to Brussels. In addition, listed real estate investment companies play an important role on the Belgian real estate market (in the past in particular B-REITs, but currently B-RRECs, see Section III.i). In recent years, the Belgian market has seen a number of high-profile transactions completed by B-RRECs, i.e. a type of listed real estate investment company (for further details see Section III.i). In early 2018, Cofinimmo and Egmont Luxemburg SARL signed a 99-year long-term leasehold regarding the Egmont I and II office buildings. The long-term leasehold was granted to Egmont Luxemburg SARL for an amount of €369.5 million. The Egmont I (36,616m²) and Egmont II (16,262m²) office buildings, both located in the central business district of Brussels, house the Belgian Ministry of Foreign Affairs, Foreign Trade and Cooperation Development. In January 2017, Axa and Befimmo finalised an agreement on the acquisition by Befimmo of a long-term leasehold of 99 years regarding the Arts 56 building for an amount of €116 million. The Arts 56 building is located in the central business district of Brussels and has a total surface of 21,000m². In 2015, Befimmo acquired the Gateway project (34,000m²), an office building located at Brussels airport, from Codic and Immobel for €140 million. 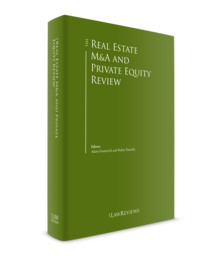 In recent years, private equity or similar private investors have been active on the Belgian real estate market as well. In May 2018, Portus Retail (a London-based retail property specialist) and the Alberta Investment Management Corporation (a Canadian institutional investment fund manager) paid approximately €300 million to acquire Docks Bruxsel, a shopping centre in Brussels, from Equilis (developer and constructor of the site). In early 2018, AXA Investment Managers acquired, on behalf of one of its clients, a long-term leasehold on the Passport office building located at Brussels Airport for €131 million, from Codic, a Belgian real estate developer. The Passport office building is a multi-tenant office comprising of 28,375m² gross leasable area. In 2017, La Française Real Estate Partners International, representing a combination of Korean and French investors, acquired the 60 per cent interest of Belfius in the joint venture with AG Real Estate, which owns the Belgian headquarters of Engie. The asset comprises two buildings located in Brussels with a total surface of 77,000m². The deal value amounted to approximately €245 million. Under Belgian law, there are two main types of publicly traded regulated investment vehicles that are used for real estate investments. Contrary to B-REITs, B-RRECs do not fall within the scope of the AIFMD Directive. Furthermore, a B-RREC is an operational company that is managed in the company’s interest, whereas a B-REIT is a collective investment vehicle that is managed exclusively in the interest of its shareholders and has a pure investment purpose. B-RRECs can be public or institutional. The public B-RREC is a B-RREC the shares of which are listed on a regulated market. The institutional B-RREC is a non-listed company, the shares of which may only be acquired by eligible investors. As at 1 June 2018, 17 public B-RRECs and seven institutional B-RRECs are registered with the Financial Services and Markets Authority (FSMA). Although the regime of B-REITs has not been repealed, all existing B-REITs have been transformed into B-RRECs, and there are no longer B-REITs active on the Belgian market. On 22 October 2017, Belgian legislation on B-RRECs was amended with a view to rendering the legal framework more flexible. For instance, public B-RRECs can create partnerships (e.g., joint ventures) of which the public B-RRECs only holds a 25 per cent +1 participation.9 In addition, B-RRECs, can now cooperate to form joint ventures. The Law of 22 October 2017 also repeals some of the limitations that inhibited the success of institutional B-RRECs and extended the scope of authorised activities of B-RRECs to investments in public private partnerships or infrastructure projects, (alternative) energy, utilities and energy related infrastructures. Finally, the Law of 22 October 2017 introduced a new category of B-RRECs: the social B-RREC. Social B-RRECs must take the legal form of a non-listed cooperative company with limited liability with a social purpose and have to focus on real estate assets with a social purpose (e.g., senior housing, educational services, etc). Social B-RRECs benefit from a fiscally transparent regime similar to that of B-RRECs. Said amendment to the regulatory framework of B-RRECs was completed by the Royal Decree of 17 May 2018, which implemented these regulatory changes into the Royal Decree of 13 July 2014 governing B-RRECs. An SREIF is an alternative investment fund of which the participation rights can only be held by eligible – institutional and professional – investors (e.g., pension funds). SREIFs have to be incorporated as a closed-end fund for a fixed period of 10 years (this period can be extended for consecutive period of maximum five years each). As opposed to B-RRECs and B-REITs, SREIFs offer more regulatory flexibility. For instance, SREIFs can be created by a single investor, no maximum debt average applies, no listing on a stock exchange is required and there is no risk diversification requirement. Furthermore, SREIFs only need to be registered with the Ministry of Finance and not with the FSMA, which means that setting up a SREIF only requires a limited cost and can be finalised rather quickly (in principle, approximately 30 business days from the date on which the complete file is submitted). SREIFs benefit from an attractive tax treatment that is identical to the tax regime that applies to B-REITs and B-RRECs. As at 18 July 2018, 25 SREIFs have been incorporated. As an alternative to regulated vehicles, investors can also opt for unregulated corporate vehicles. Such unregulated companies are in principle not subject to specific regulations. Public limited liability companies and private limited liability companies are the most commonly used unregulated corporate forms for Belgian real estate holding companies. Certain investors also opt for a Belgian ordinary limited partnership. Public limited liability companies can be formed by two (or more) shareholders with a minimum share capital of €61,500. Private limited liability companies can be formed by at least one shareholder with a share capital of €18,500. The incorporation process of a company in Belgium is efficient and will, in principle, not take longer than one week if all the incorporation documents are properly prepared. In addition, no approval from any public authority is required prior to the incorporation of this type of companies. On 25 May 2018, the Belgian government approved a new draft of the Belgian Code of Companies and Associations that, in essence, will introduce major legislative changes making Belgian corporate law more flexible. Under the new code, it will no longer be required for a private limited liability company to have a share capital and Belgian companies will have significant flexibility to create different types of shares and to determine the rights and obligations attached to those shares. It is expected that the Belgian Chamber of Representatives will approve the draft of the new Belgian Code of Companies and Associations in the second half of 2018 and that the new code will enter into force in early 2019. This new corporate legal framework will be one of the most flexible corporate frameworks in the European Union and is aimed, inter alia, at attracting more foreign investors. Acquisitions of real estate assets in Belgium are usually structured through either an asset or a share deal. Cherry-picking: in an asset deal the buyer only acquires the real estate asset and the liabilities specifically linked thereto. As part of a share deal the buyer has to acquire all other assets and underlying liabilities of the target company owning the real estate asset. Depreciation of the real estate asset: The book value of the real estate asset transferred by way of an asset deal will lead to a step-in value, while a share deal will not, meaning that the buyer in a share deal will not be able to depreciate the assets at market value. Notarial deed and other formalities – timing: An asset deal requires the intervention of a Belgian notary. In addition, several documents relating to the real estate asset have to be obtained from the governmental authorities (e.g., planning information or an extract from the mortgage and land register), thus triggering additional costs and a delay of the timing of the transaction. Depending on the location of the real estate asset, obtaining all these documents can take several months. None of these formalities, including the intervention of a notary, apply in the context of a share deal. Transfer tax: In case the real estate asset is transferred by way of an asset deal, the buyer has to pay registration duties at a rate of 10 to 2.5 per cent (see Section IV.v). Transferring shares of a Belgian company is, in principle, not subject to registration duties. In light of the aforementioned absence of registration duties or other form of transfer tax on a share deal, most real estate transactions in Belgium are often structured as a share deal to the extent the composition of the assets and liabilities of the target company allows to do so. Note that the tax authorities may requalify a share deal into an asset deal if the sole reason for opting for a share deal is to avoid the aforementioned registration duties on an asset sale. An alternative to standard asset or share deals is to structure the transfer as a corporate restructuring such as a merger, (partial) demerger or a contribution in kind of a business line consisting of the real estate assets owned by the target company. Practice shows that in particular partial demergers are sometimes used for real estate transactions. As part of a partial demerger, the holding company transfers the relevant real estate assets of the buyer by way of a contribution in kind to the share capital of (a company owned by) the buyer. The process of a real estate share or asset deal typically (but not necessarily) begins with negotiating the general key commercial terms that are materialised in a (mostly, non-) binding preliminary agreement (in practice such agreement goes by different names, such as a letter of intent, heads of terms or a memorandum of understanding). In this preliminary agreement parties typically also agree on a timeline, next steps of the transaction process and a clause covering the exclusive character of the negotiations. As a next step, the buyer performs a due diligence on the (company owning the) real estate asset. Due diligence on a Belgian real estate asset typically involves reviewing the following matters: title, existence of third-party rights (e.g., leases, easements, encumbrances and mortgages), soil pollution, waste, asbestos and other hazardous materials, insurance, planning and zoning situation, building permits, environmental permits and other required governmental authorisations. The scope of the due diligence in a share deal is usually broader than a due diligence in an asset deal as the review should not only cover the real estate asset itself but also the target company of which the shares are being transferred, which in particular will require a review of the financial, tax and corporate situation of the target company. If the transaction is structured as a share deal, parties will negotiate and sign the share purchase agreement (SPA), which will set out the legal and commercial terms in relation to the transfer of the shares to the buyer. The SPA is a private document for which no intervention of a notary is required. Closing of the transaction occurs either simultaneously with signing of the SPA or after fulfilment of the conditions precedent mentioned in the SPA. On the closing date, the buyer pays the purchase price to the seller, the shares of the target company (and thus, indirectly, the real estate assets held by the target company) transfer to the buyer and the share transfer is recorded, for enforceability purposes, in the share register of the target company. An asset deal is usually also implemented by means of a split signing and closing: signing of a private agreement once the conditions precedent have been fulfilled, and signing of a notarial deed at closing. Strictly speaking, parties do not have to enter into a private agreement and can immediately prepare the notarial deed but in practice most parties decide to first enter into a detailed preliminary sale and purchase agreement governing all terms and conditions of the sale (compromis). The notarial deed is mainly required in order to render the transfer enforceable vis-à-vis third parties: the notary will draw up a notarial deed that will then be registered with the competent mortgage register (the name of the register is misleading: it is the main register for real estate rights such as title, the aforementioned long-term leases, rights of superficie, mortgages, etc.). In most assets deals, the buyer pays a deposit, usually amounting to 5 to 10 per cent of the final purchase price, into a third-party account of the notary upon signing the compromis. After signing the compromis, parties will instruct their respective notaries to prepare a notarial deed confirming and restating the conditions of the compromis. The closing of an asset deal normally takes place in the office of the buyer’s notary. The buyer will pay the balance of the purchase price, registration duties due and a provision to cover the notary’s fees and costs, into the notary’s third-party account. Upon signing of the notarial deed, the buyer’s notary will use the amounts received to cover certain payments linked to the transaction (e.g., reimbursement of a loan secured by a mortgage over the property (if any), payment of registration duties, payment of the balance to the seller, etc.). The buyer’s notary will subsequently take care of the formalities to register the transfer of ownership with the competent mortgage register. information regarding the real estate asset’s soil. (absence) of legal proceedings or disputes with regard to the ownership or use of the real estate asset. The SPA will include representations and warranties regarding the above topics but these will also cover other matters, mainly regarding the target company itself (e.g., regarding its corporate, financial and tax situation). Most SPAs will also provide for a specific purchase price mechanism, usually based on a closing accounts mechanism. Under such mechanism, the buyer pays a provisional purchase price upon closing as determined on the basis of a historical balance sheet of the target company. Post-closing, parties will agree on a balance sheet that reflects the financial situation of the target company as at closing. Based on the agreed closing accounts, parties will recalculate the final purchase price and settle the difference with the provisional purchase price paid. According to publicly available information as at 1 June 2018, no hostile transactions have occurred in Belgium with regard to regulated or unregulated real estate companies. Several real estate companies and B-RRECs have, however, implemented traditional defence measures against hostile takeovers in line with existing international standards, such as the possibility to repurchase own shares or poison pills. Generally speaking, debt financing is used for Belgian real estate deals to cover part of the price and the costs, especially over recent years in light of the low interest rates offered by lenders. Interest expenses on loans are generally tax deductible at the level of the company acquiring the real estate asset and Belgian tax legislation does not impose a general thin capitalisation rule (it being understood that some exceptions exist, e.g., in case of intra-group loans). c pledge over the receivables (e.g., rental income) and bank accounts. Lenders will notably request a mortgage or a mortgage proxy. For large transactions, the lender will typically request additional securities, such as a pledge over receivables or on the shares of the company owning the real estate. A mortgage must be enacted in a notarial deed and has to be registered with the mortgage register, which is subject to registration and mortgage inscription duties, respectively amounting to 1 per cent and 0.30 per cent of the mortgage amount. To reduce the registration and mortgage inscription duties of the borrower, lenders do sometimes accept to be granted a mortgage proxy. A mortgage proxy is enacted in a notarial deed, whereby the lender is irrevocably and unconditionally granted the power to secure its claim on a future date by establishing a mortgage against the real estate asset of the borrower, for the amount agreed in the proxy. While mortgage proxies do minimise costs, these also increase the risks for the lender as a mortgage proxy does not grant a security over the assets, which means that if the borrower grants a mortgage on the same real estate asset to another creditor before the conversion of the mortgage proxy, the mortgage first registered will rank first. For other forms of security, such as a pledge over shares, receivables or bank accounts, no substantial taxes or fees will be due. Only a lump sum duty of €0.15 on certain finance documents executed in Belgium (payable on each original finance document within the scope of the duty) and potentially a minor registration duty has to be paid in relation to registering the pledge with the national pledge register. The overview below provides a brief summary of the main taxes that apply on selling or acquiring real estate assets in Belgium, either through a share or asset deal. In contrast to asset deals, registration duties are, in principle, not due in case the shares of the company owning the real estate are transferred. However, a share deal will not lead to a step-up in value, meaning that the buyer will not be able to depreciate the assets at their market value. the seller held the shares in full legal ownership for at least one year without interruption. Non-fulfilment of one of the two first conditions makes that the capital gains will be subject to the full corporate income tax rate of 29.58 per cent (as from 2020, 25 per cent) or 20.40 per cent (as from 2020, 20 per cent) for ‘small’ companies13 on a first income band of €100,000. If only the third condition is not fulfilled, a reduced corporate income tax rate of 25 per cent (plus a supplementary crisis contribution of 2 per cent, i.e., 25.50 per cent in total) or 20 per cent (plus a supplementary crisis contribution of 2 per cent, i.e., 20.40 per cent in total) for small companies on a first income band of €100,000) will apply. As from 2020, capital gains will be subject to a corporate income tax of 25 per cent or 20 per cent for small companies in respect of the first €100,000 in case one of the three conditions is not fulfilled. For Belgian individual shareholders, capital gains realised on the sale of shares are tax-exempt to the extent these shares are not held for business purposes and there has been no speculative activity nor any transaction of abnormal management of the private estate. In the event of a speculative or abnormal sale of shares, a separate tax rate of 33 per cent (plus a municipal surcharge) will apply to the capital gains. If a Belgian individual shareholder holds the shares for business purposes, capital gains on the sale of shares are normally taxed at the general progressive income tax rates for Belgian individuals. A separate tax rate of 16.5 per cent (plus a municipal surcharge) applies if the shares are held for more than five years. The minimum five-year holding period does not apply when the capital gains are realised in the context of the winding-up of a business or a branch of a business. To mitigate risks of requalification of a share deal into an asset deal, it will be important to sell the company as a going concern with all contracts and undertakings relating to the assets (e.g., rental contracts, permits, (mortgage) loan agreements, etc.) in the company. Assets deals packaged as share deals purely for tax purposes will trigger the application of the general anti-abuse provisions of Belgian tax law or could even be set aside. In case the real estate asset is transferred by way of an asset sale, the buyer has to pay registration duties at a rate of 10 per cent (if the real estate asset is located in the Flemish region) or 12.5 per cent (if the real estate asset is located in the Brussels Capital or the Walloon Region) calculated on the purchase price mentioned in the agreement or the market value of the real estate asset, whichever is higher. If the transfer is subject to VAT (see below), no proportional registration duties are due. If the sale of the real estate assets leads to capital gains for the seller, such capital gains are taxed at the full corporate income tax rate of 29.58 per cent (as from 2020, 25 per cent) or 20.40 per cent (as from 2020, 20 per cent) for small companies on a first income band of €100,000. Payment by the seller of such corporate income tax can be deferred if the real estate asset has been held as a fixed asset for more than five years, subject to reinvestment of the full proceeds of the sale price, within three to five years as from the first day of the financial year in which the gain was realised14 in depreciable15 intangible or tangible fixed assets that are used for business purposes in Belgium or in any other Member State of the European Economic Area. Capital gains realised by non-resident companies on the sale of real estate asset located in Belgium are subject to a withholding tax retained at source by the notary public. Afterwards the companies may, however, offset any relevant charges and losses carried forward against this income through their annual tax return. As such, the withholding tax only results in a pre-financing cost. The creation or the acquisition of a long-term lease or a building right is subject to registration duties at the rate of 2 per cent calculated on the total price and charges due by the beneficiary of the building right or long-term lease. The creation or transfer of a usufruct right on a Belgian real estate asset is taxed at a rate of 10 per cent (if located in the Flemish region) or 12.5 per cent (if located in the Brussels Capital and Walloon Region). A contribution in kind of (a part of) a real estate asset16 into the share capital of a Belgian company, or the transfer of such property through a merger or (partial) demerger, is generally not subject to proportional registration duties or to VAT, provided certain conditions are met. In such cases only a fixed duty of €50 is payable upon registration of the notarised deed. The transfer or grant of title or other rights in rem concerning ‘new’ buildings can be subject to VAT at a rate of either 6 per cent, 12 per cent or 21 per cent. A newly constructed building is considered to be ‘new’ for VAT purposes until 31 December of the second year after the year it is first brought into use or taken in possession (this also applies to renovated buildings that have been structurally modified or that have been given a new use or function). The purchase of land associated with a new building is subject to the same VAT treatment as the purchase of the new building if that land and the new building are sold simultaneously by the same owner. No VAT is due on the part of the price attributable to the land if the building is not new or if the new building is not sold simultaneously with the land or is sold simultaneously but by a different party. In such case, the buyer will have to pay registration duties on the sale of the land at a rate of 10 per cent (Flemish region) or 12.5 per cent (Capital or the Walloon Region). In principle, there is no taxation of B-RRECs’ and SREIFs’ current income. Such entities are subject to the standard corporation tax rate of 29.58 per cent (25 per cent as from 2020), but their taxable income only consists of limited specific items, such as received abnormal or gratuitous advantages (i.e., benefits that a company would normally not obtain in an arm’s length situation) and certain expenses that are not tax deductible. An exit tax will, however, apply, at the special corporation tax rate (of currently 12.75 per cent (i.e., 12.5 per cent plus 2 per cent crisis contribution)), on the difference between the market value and the recorded value of all transferred assets when an existing ordinary taxed company is converted into a B-RREC or a SREIF. The same special corporation tax rate applies to reorganisations involving a B-RREC or a SREIF (unless only such entities are involved), including the contribution by an ordinary taxed company of a real estate asset into the share capital of such B-RREC or SREIF. When transferring real estate assets by way of an asset sale, there is no taxation of capital gains at the level of the B-RREC or the SREIF, since capital gains are not part of the taxable income of such entity. Capital gains resulting from the transfer of shares in a B-RREC or SREIF are not taxed in the hands of a private shareholder to the extent these capital gains are realised outside any business activity and are consistent with the normal management of the taxpayer’s estate. In the hands of a corporate shareholder such capital gains will normally not be exempt from corporate income tax, unless the conditions of the participation exemption regime (as mentioned above) are fulfilled. There are no specific restrictions for foreign entities to investment in Belgian real estate unless the real estate assets concerned are used for a business in a restricted sector (e.g., for certain assets used for energy production). In principle, there are also no restrictions on obtaining loans from either Belgian or foreign banks. In Belgium, the operation of real estate assets is frequently carried out by a separate operation or management company. Opco/propco splits mainly take place in the hotel and senior housing sector, where operation contracts are usually signed between the owner of the real estate asset and operation companies. Also, private equity-owned companies investing in Belgian real estate may separate the company’s ownership from the operational management. As a general principle, B-RRECs should exercise their activities themselves, without the intervention of a third party (other than an affiliated company). This does not mean that a B-RREC is not allowed to call upon external suppliers, such as architects or contractors or to outsource the execution of tasks; but ‘property management’ cannot be outsourced. The responsibility for, and the coordination of, the business activity should at all times remain with the B-RREC. The general market outlook for real estate investments in Belgium is positive owing to interest rates that remain at a reduced level for the moment and the currently positive economic outlook. There is certain speculation that Brexit may result in Brussels, as the capital of Europe, attracting large corporates looking to relocate (at least part of their activities) to continental Europe. As concerns the retail market, occupier activity was subdued in Belgium during the first quarter of 2018. Consumer confidence levels are high, underpinning the recovery of the economy overall, but there still remain relatively high vacancy levels.18 This means that there are currently good opportunities for expanding retailers on the Belgian market. The new Belgian corporate legal framework, which is intended to enter into force in early 2019 (see Section III.ii), is likely to convince more foreign investors to increase their activity in Belgium, including in the Belgian real estate market. 1 David Du Pont, Jörg Heirman and Clément Dekemexhe are lawyers at Ashurst. 2 CBRE, Belgium Market Trends 2018, 9 February 2018. 3 CBRE, Brussels Office Market View Q1 2018, 10 April 2018. 4 Savills, Briefing European Investment, March 2018, p. 8. 5 In 2017, the Brussels Capital region attracted investments worth €1.82 billion, which represents 49.5 per cent of total investment volume in Belgium. 6 B-REITs were introduced by the Law of 4 December 1990 on Financial Operations and Financial Markets, which is now incorporated in the Law of 19 April 2014 on Alternative Investment Funds and their Managers. 7 Directive 2011/61/EU of the European Parliament and of the Council of 8 June 2011 on Alternative Investment Fund Managers and amending Directives 2003/41/EC and 2009/65/EC and Regulations (EC) No 1060/2009 and (EU) No. 1095/2010. 8 The corporate vehicle of a B-RREC was introduced by the Law of 12 May 2014 regarding regulated real estate companies and the Royal Decree of 13 July 2014 concerning regulated real estate companies in order to encourage public investments in real estate. 9 Previously, a public B-RREC was required to hold at least 50 per cent of such joint venture and was required to have joint or exclusive control over its subsidiaries. 10 SREIFs were introduced by the Royal Decree of 9 November 2016 on the implementation of the SREIF. 11 Real estate certificates experienced a lot of success in the 1980s. From then on, real estate certificates became a genuinely liquid real estate investment, although they did lose some popularity following the success of Belgian REITs. 12 The subject-to-tax test looks whether the company of which the shares are transferred was subject to a normal corporate tax regime, similar to the Belgian corporate tax regime, without benefiting from a common tax regime that is considerably more favourable than the Belgian tax regime. 13 A company is considered to be ‘small’ under Belgian tax law if it stays below at least two of the following three thresholds during two consecutive financial years: (1) average number of employees (yearly) of 50, (2) annual turnover (excluding VAT) of €9 million, and (3) total balance sheet of €4.5 million. 14 The five-year period applies for reinvestments in built real property, airplanes or ships. It is also possible to select assets acquired in the past (i.e., as of the first day of the second-last financial year preceding the realisation of the gain). 15 Investments in land will therefore be excluded as reinvestment. 16 Other than a real estate asset used or destined for private housing. 17 Cushman & Wakefield, Office Market Snapshot, First quarter, 2018. 18 Cushman & Wakefield, Retail Market Snapshot, First quarter, 2018.